This week's bread is a fun one. It's the usual Jewish Deli Rye, only with no caraway seeds! 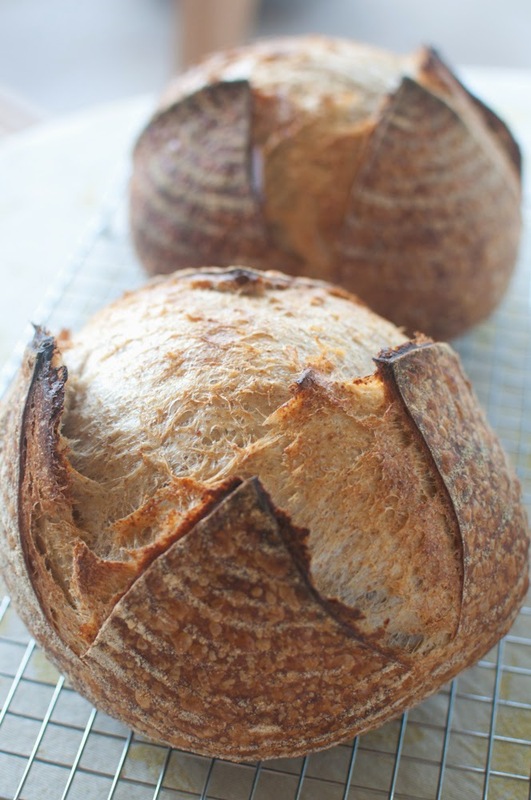 Originally, we were going to mill the caraway seeds and add them to the dough in place of the whole seeds, to see what we (and the share) thought of a rye bread with caraway flavor, but no whole seeds. I like the seeds. Some people don't. I get that. Then it occurred to me that it's possible that there are folks in the bread share that have never had a rye bread that didn't have caraway seeds in it at all! I know that the flavor of caraway is so deeply engrained in what I think of as the taste of "rye bread" that until I made a loaf of rye bread without caraway, I never considered that rye bread has a flavor all its own that is subtle enough that it's lost under the assertive spice of caraway. This time, I ground the rye to a very coarse pumpernickel grind. We hope you like it, and look forward to your reaction to this odd loaf...you won't be seeing it again, though I anticipate that soon we'll have a "real" rye bread with a good bit more rye flour. We're working on something worth sharing right now! Here's this week's loaf. Nary a caraway seed to be seen in this week's Deli Rye! 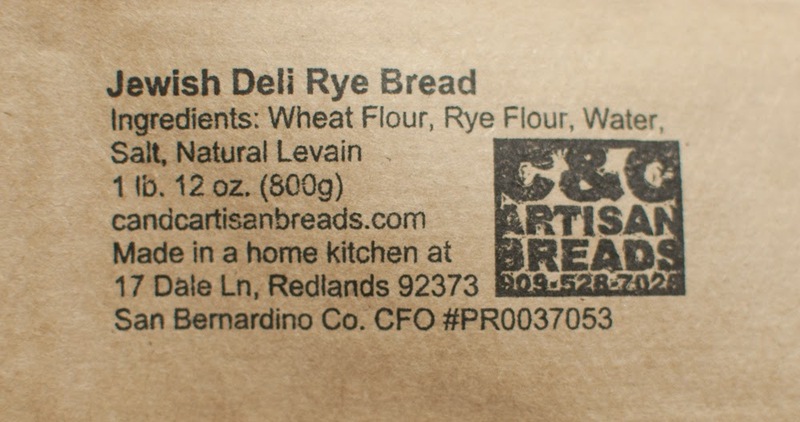 I thought I'd be crafty and cross out "caraway seeds" from the ingredient list on the stamp for the Deli Rye, then was disappointed to see that I'd forgotten to include it on the ingredient list. Oops! Forgot the "caraway seeds" on the stamp...so it works well this week! Cam and I have been enjoying a subscription to one the the LA Phil's Saturday night subscriptions this season. Part of what makes the symphony such a pleasure is finding great places to eat before the performance, which usually begins at 8pm. We've gravitated to ramen shops and other Asian restaurants, but have also sampled fish and chips at downtown dive bars, among other delicious things. There's a lot of good food out there. 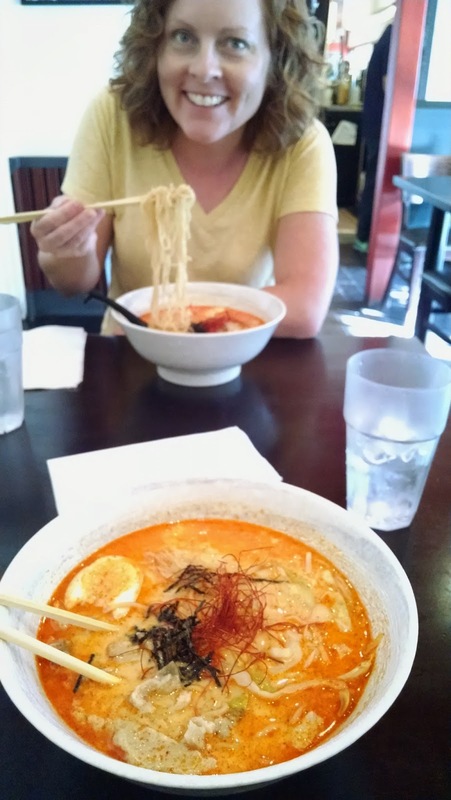 As proof that we don't just eat bread and pastries, I offer this snapshot of Cam enjoying a big bowl of spicy Tonkotsu ramen at Men Oh in Little Tokyo, not far from the Walt Disney Concert hall. Last night's performance was really fantastic. A recital by Lang Lang. For more than two hours, this phenom banged out one world-class performance after another, starting with Bach's Italian Concerto in F Major, followed by The Seasons by Tchaikovsky. Sublime. This was all before the intermission. After intermission, Lang turned in a mind boggling performance of Chopin's Scherzos 1, 2, 3, and 4. The lid of the Steinway fluttered like a leaf in a gale while Lang hammered away at these piece's more enthusiastic sections. It was amazing. Transcendent. A delight. However, I have to admit, I had a lot of trepidation, knowing that this performance was going to be at the Walt Disney Concert hall and that it was going to be a packed house of Angelenos, who are, without question, the worst, most inconsiderate, and selfish symphony-goers in the United State, probably the world. It's not limited to symphonies either. LA is the single worst place in the nation to witness live music. Look at the tour calendars of lots of musicians; they'll cover the entire nation and completely skip Southern California. I can't blame them. I'd rather have beer bottles thrown at me while I played behind chicken wire in a west-Texas honky tonk than have to suffer through being Lang Lang on stage at the La Phil. At least the bottle-throwers are paying attention. In LA, for a lot of people in the venue, it's much more about the selfie for instagram than it is about respectfully enjoying the performance. The problem in LA can be boiled down to that one fact; the fans do not respect the artist they have come to see. The situation is compounded by two things about the Walt Disney Concert Hall, one spectacular, one horrific. The acoustics are tremendous. I swear, you could hear someone whispering anywhere in the hall from anywhere else in the hall. They thought of just about everything, including specially upholstering the underside of the chairs so an empty chair has the same impact on the acoustics of the hall as an occupied one. Really. Pretty neat, huh? This plays into the horrific part. 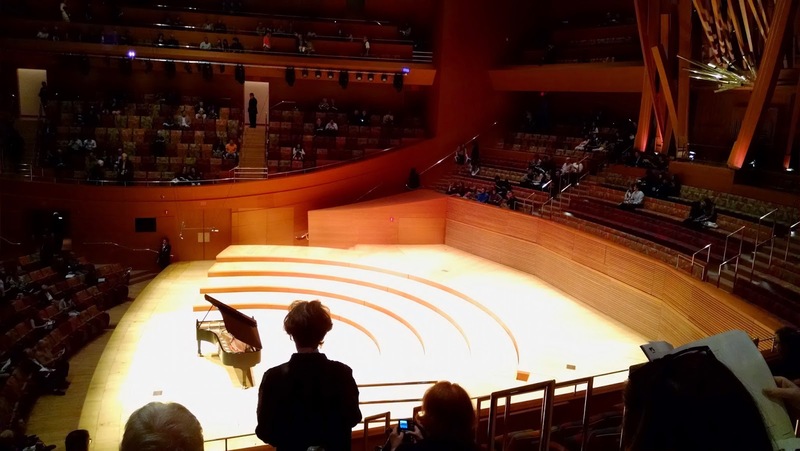 Between Frank Gehry (the building's architect) and Yasuhita Toyota (the hall's acoustician), neither must have given a lot of thought about what would happen when actual Angelenos filled the hall, because the floors in the seating area are un-carpeted wood. This means that any item that hits that floor during the performance is going to be heard by everyone in the hall. It's brutal. At our first visit to the LA Phil, a dropped cane in the middle of a quiet violin solo reverberated like a gunshot. Each of the dozens of programs that slide off the laps of Phil patrons produces sounds somewhere between a loud slap and the flutter of a flock of birds leaving a tree, depending on how it hits. And each time it happens, the whole hall gets to hear it. Last night, there were at least a dozen dropped programs, often accompanied by the crack of the smartphone that was on top of the glossy-magazine-slippery program hitting the hardwood. At one of the rare quiet moments in Chopin's second Scherzo, a pre-teen four rows in front of us let loose with an entire bag of spilled skittles, which sounded either like a machine gun or fifteen dice games going at once. I couldn't decide which, but suffice it to say, it was distracting. Normally at the symphony, you can expect some snoring from the occasional octogenarian who dozes off at a quiet moment. Not at the LA Phil. Instead, you get to enjoy the sound of wind chimes every time the elderly woman 15 seats away moves her arm, on which she's wearing 50 jingly bangles. When she's sitting still, another elderly gent, evidently with the short-term memory of a gnat, is turning a very loudly switched flashlight on and off every 50 seconds or so to pore over his program, I assume in an attempt to figure out which of Tchaikovsky's Seasons we were on. CLICK... CLICK. It's lucky for him that he put the flashlight away at intermission. If I had to listen to that during Chopin he'd have had to enlist the services of a proctologist to find his flashlight. Thankfully, Chopin is so engaging that even the minute attention span of last night's audience was enamored enough to pay attention. At least when things were exciting. When the entire orchestra is in the hall, it's at least loud enough to cover some of the annoyances. There's no mercy in a recital. You hear everything. Nothing but one piano in the Walt Disney Concert Hall; a formula for disaster. TURN OFF ANYTHING WITH AN ON/OFF SWITCH AND LEAVE IT OFF. SIT AS COMPLETELY STILL AS POSSIBLE. HOLD NOTHING IN YOUR LAP. That would pretty much cover it. You could add "NO FOOD OR BEVERAGE" though that should be covered by "Make no sound." If you can't go an HOUR without a drink, you should be in a hospital, yet I see plenty of people enjoying beverages in their seats. Really? You could put something on there like "IF YOU HAVE A COUGH, WHY ARE YOU HERE?" or at least "IF YOU'RE GOING TO NEED COUGH DROPS, UNWRAP ENOUGH TO LAST THE PERFORMANCE BEFORE THE PERFORMANCE BEGINS." But that should be a given. Even with these precautionary measures, I suspect that the situation would not be improved. Enjoy the bread this week! 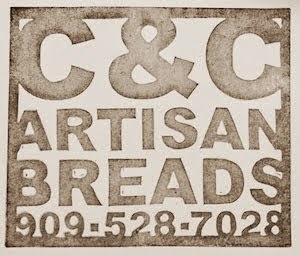 Next week is Free Bread Week, then back to it in the first week of April.